Brenden Fletcher, Babs Tarr, and Cameron Stewart are doing some exciting work on 'Motor Crush' as they continue to raise the stakes for their heroine Domino. The world is closing in on her and the pressure to win has never been higher. All the while, she's trying to balance her relationships and fighting Crush withdrawals. What does the introduction of a mysterious stranger mean for her going forward? I've stated before that any new series reaches a point early on, issue three or four, that is a make-or-break moment. Will the plot hold up? Does the series pick up steam or bog down? Is the story supported with new revelations or new information? These are things I ask myself when reading and 'Motor Crush' passes all those questions it breaks down the lead character in a surprising arc that develops her even further. When we first meet Domino in issue one she's extremely confident, a fantastic racer emboldened by her addiction to Crush. She seems to be fully in control of her life. Slowly over three issues, Fletcher and Stewart begin to deconstruct her life providing the conflict she'll need to overcome. She tries to repair her relationship with her ex, Lola, a talented mechanic while also keeping her addiction from her father. She's having withdrawals as her stash has been depleted. On top of all that she's qualifying for the Grand Prix and trying to earn more Crush through the underground circuit. It's a lot of juggling in order to keep her life in order and suddenly she's lost control. You don't see this turn of events coming and it helps humanize the formerly indestructible persona of Domino. It's all the more intriguing because of it. Babs Tarr again demonstrates an expert touch in conveying the many emotions flowing through Domino at any given time. The body language and facial expressions don't need words on the page to tell what she's feeling. The most soul-baring moment is reflected in her humbling discussion with Lola. Along with exciting and colorful race scenes, Babs character designs and layouts keep 'Motor Crush' buzzing with fast and furious bravado. 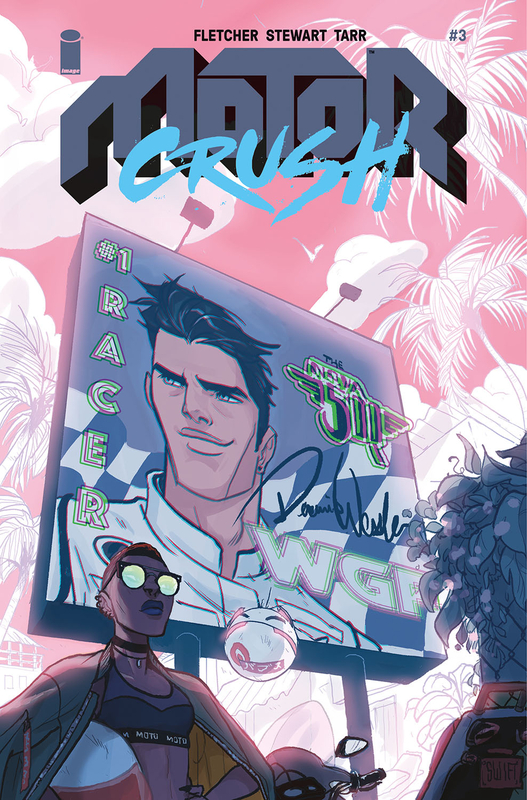 'Motor Crush' continues to shine as Domino becomes more humanized under the weight of her own decisions and their consequences. The stakes are raised higher and higher giving the series momentum going forward. Fletcher and Stewart have thrusted the story into another gear while Tarr bangs out more emotive and bone-crushing visuals. This is not to be missed.